Looking for the perfect dessert? 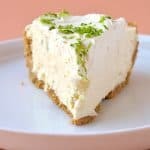 Try this gorgeous no bake Key Lime Pie boasting a creamy lime cheesecake filling, made with cream cheese, condensed milk, fresh limes and whipped cream. 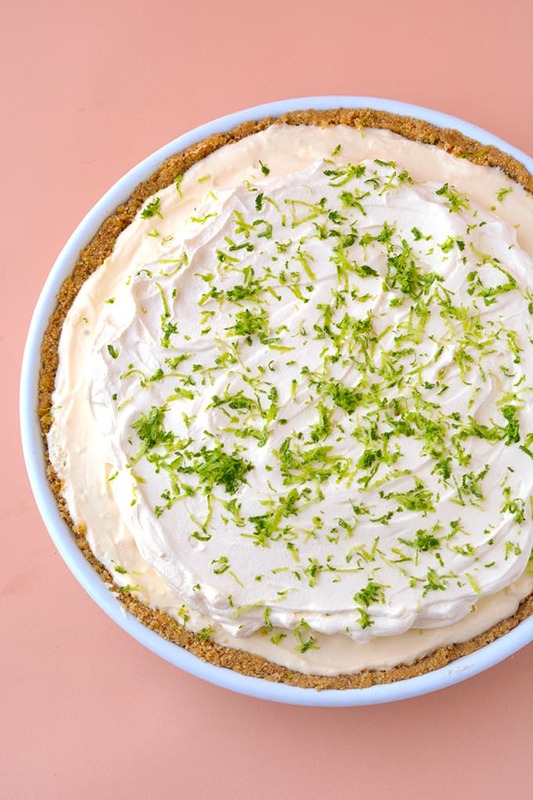 You’re going to love this easy No Bake Key Lime Pie. 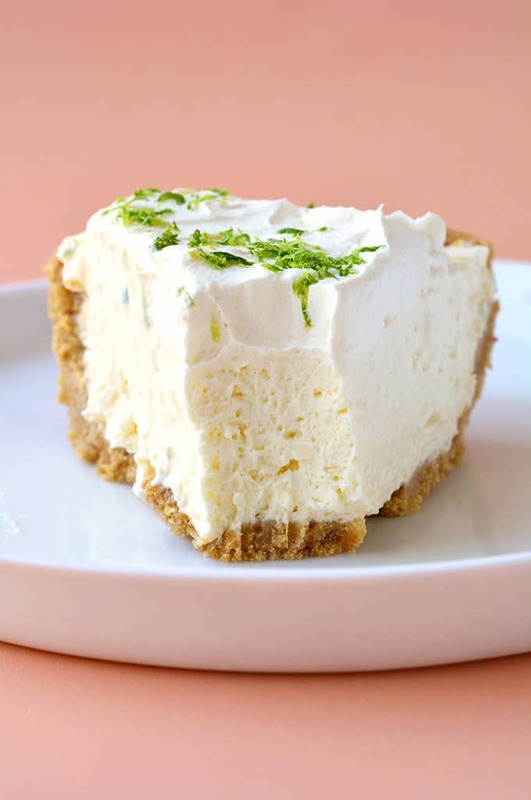 With a crumbly cookie crust, a creamy lime cheesecake filling and a thick layer of freshly whipped cream, it’s a no bake delight. It’s quick, easy AND wickedly delicious. I’ve been all about pies lately. Remember my No Bake Peanut Butter Pie I shared a few weeks ago? There’s just something magical about a luscious no bake pie that’s homemade. So today, we’ve taken an American classic, Key Lime Pie, and transformed it into the ultimate no bake dessert. The first layer is a homemade cookie crust, made with store bought cookies and melted butter. Next is my favourite – the creamy lime filling. 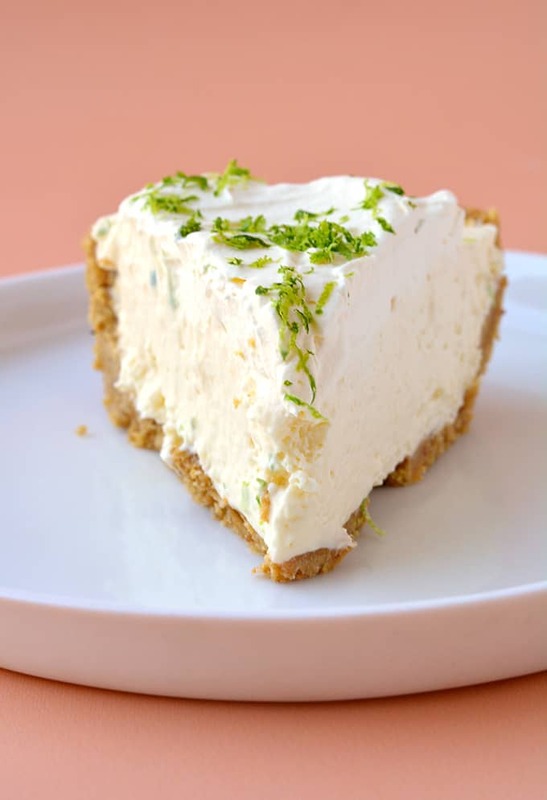 Tangy cream cheese, freshly squeezed lime juice, sweetened condensed milk and cream are combined to make a thick, sweet and tangy cheesecake. Once it has time to set (overnight is best), it’s time for a final layer of whipped cream and a sprinkling of freshly grated lime zest. 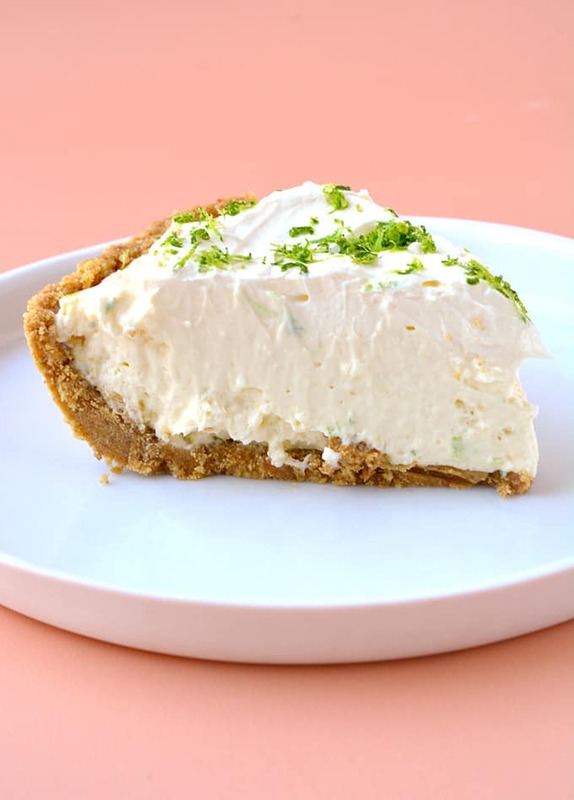 It has all the mouthwatering flavours of traditional key lime pie, but you don’t even need to turn the oven on for this no bake version. 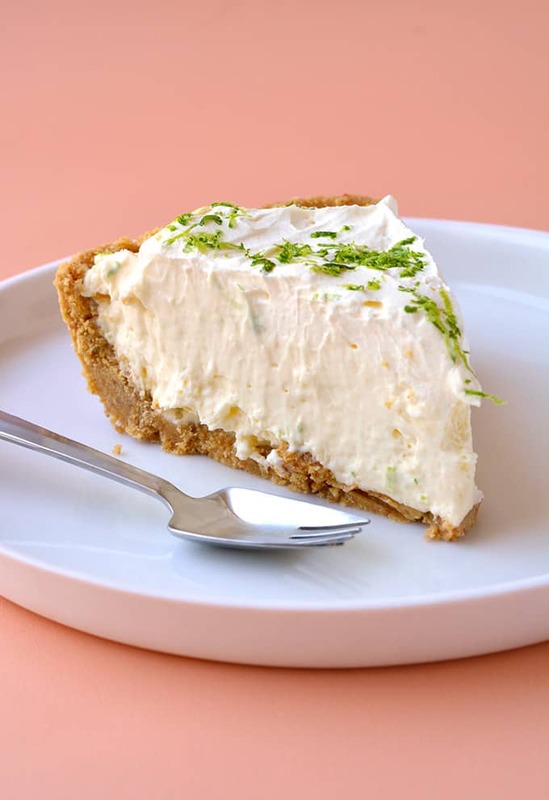 There’s just something about the soft and fluffy texture of this No Bake Key Lime Pie that makes this dessert extra special. Your fork will just slide right through the creamy filling until it reaches that buttery cookie crust. It’s a mess of whipped cream, tangy limes and luscious cream cheese. 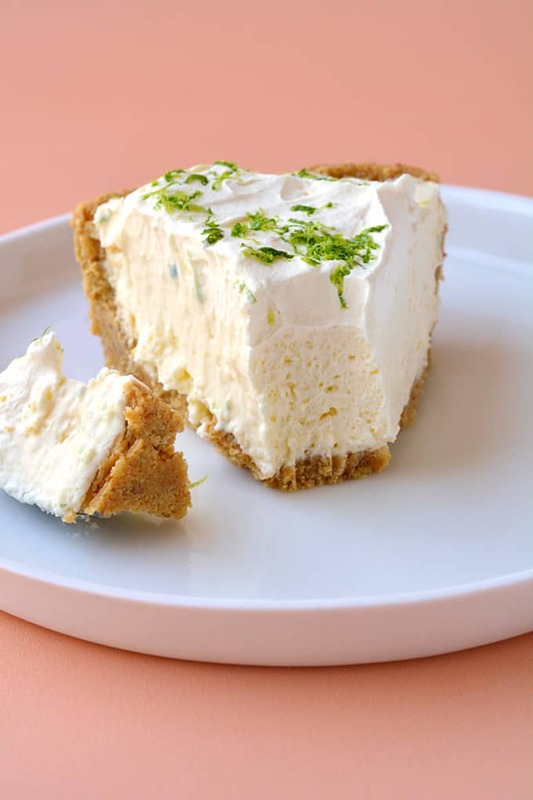 A creamy no bake Key Lime Pie topped with whipped cream. 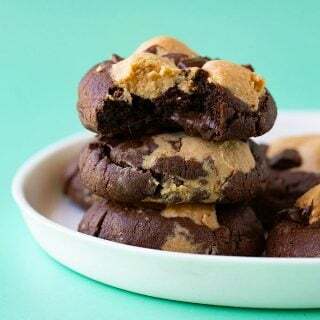 Add cookies to a food processor or blender and whiz until finely crushed. Add melted butter and mix well. Pour crumbs into a 9-inch pie plate. Press down firmly to form a crust and place in the fridge. Add cream cheese in a large mixing bowl. Use an electric mixer to beat until smooth. Add condensed milk and lime juice and beat briefly until combined. Finally, add cream and beat for 2-3 minutes until mixture is thick and creamy. Pour lime mixture over crust and smooth top. Place in the fridge for at LEAST 6 hours, or even better, overnight. Place cream in a large mixing bowl and beat with an electric mixer until cream is whipped. 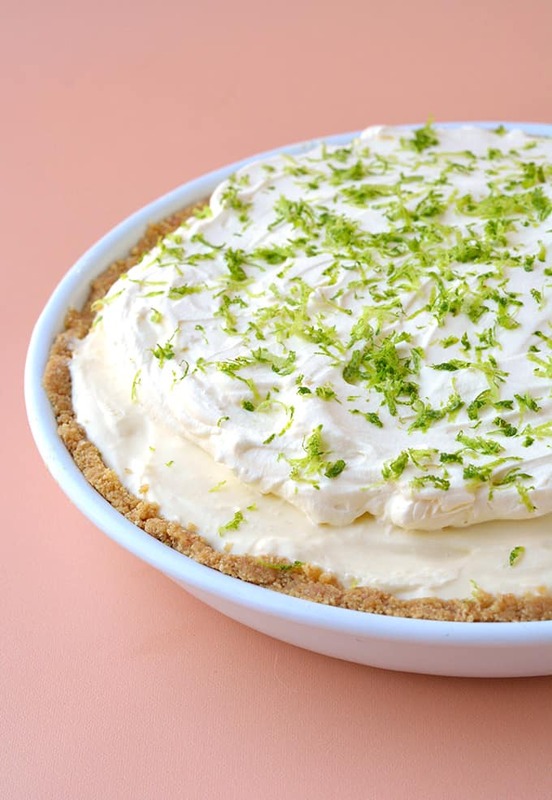 Cover key lime pie with cream. Scatter over lime zest. Cut and serve. *I use Digestive biscuits, but you can use graham crackers or Arnott’s Granitas. Perfection! This was so easy to get together… I was actually able to find fresh key limes, so I juiced those instead.. Served some homemade raspberry sauce over top!! Oh my goodness!!! 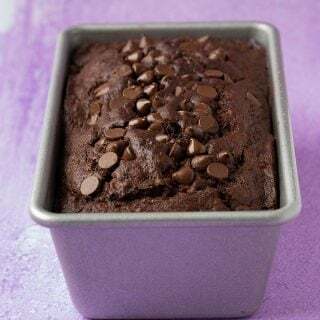 Thanks for sharing your recipe!!! 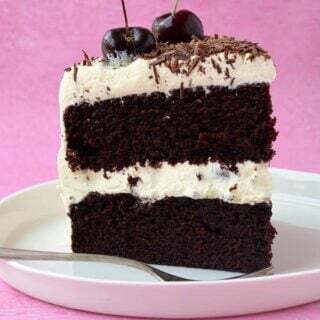 Made this along with your Oreo Nutella Cheesecake for Christmas Eve! It was absolutely amazing…family loved both but this one was the overall favorite! Oh so pleased to hear that Lauren! ☺️ Thank you for the lovely feedback! to the filling; added sweetened coconut, powdered sugar and vanilla to the whip cream; used a different recipe for crushed Graham crackers (all I had in my pantry) with macadamia nuts for a the crust. Layered in jars for Christmas gifts! I’m making this right now…I live in the Florida Keys (Big Pine Key) and I just had a bumper crop of Key limes from my 1 tree I have. 🙂 Its my first attempt ever at making this delicious pie! And FYI this is literally as close to the original recipe from Key West (1880s only 3 ingredients besides key limes) they only had Iberia Sweetened condensed milk. So that’s what I’m using. Thanks for this recipe. I’ll let you know how it turns out! Wish me luck!! I love key lime pie! Looks so delicious and perfect for the summer!